Royal Rendezvous Solitaire uses 104 cards (2 decks). 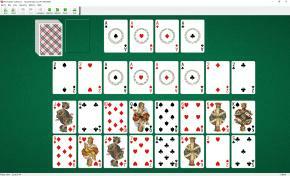 8 aces are removed from the deck and placed in two rows. Four twos of different suits are also removed from the deck and placed in the lower row of aces, two at each end. The aces and twos are foundations. You have 18 reserve piles (with one card per pile) dealt below the foundations. Build the top row of Aces up in suit to Queens. Build the Aces of the second row of foundations up in suit by twos: A, 3, 5, 7, 9, J, K.
Build the Twos of the second row of foundations up in suit by twos: 2, 4, 6, 8, 10, Q. The four remaining Kings are built on the top row of foundations, but only after their counterparts have been built in the second row of foundations. The top cards of reserve piles and the waste pile are available to play on foundations. You cannot move cards from one reserve pile to another. Spaces are automatically filled from the waste or stock piles.